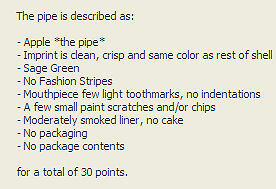 The value of pipe #485 is 30 points. Jerry Wessel held an auction on eBay for this very nice pipe. I was fortunate to win the bidding and would have added it to collection without hesitation had I not just received an un-smoked specimen from Andrew Williams. So this one goes to the Pipes for Trade page to be smoked until someone offers me something more useful to the collection for it. I seldom smoked this one so when Brian Ciesicki offered to buy it I was delighted to oblige.